If any more evidence were needed of just how confident the ruling class in the UK feels today the so-called bedroom tax is it. Like so many of the ‘all in it together’ attacks this one is deliberately aimed at weaker sections of the working class who are in no position to fight back on their own: people on the lowest wages and the unemployed who must rely on benefits. Basically the bedroom tax (due to be introduced in April) means that anybody with a spare bedroom who rents from either the council or a housing association will face a cut in Housing Benefit of 14% for one extra bedroom and 25% for two or more bedrooms. Most people stand to lose an average of £14 a week, with housing association tenants losing on average £16 a week (1). In all some 660,000 people will be affected. About 95,000 tenants in England could be pushed into arrears as a result (2). This is clearly not about trying to re-allocate housing space to where it is needed most. For a start there is no surplus supply of smaller properties to redistribute! Yet worried tenants seeking advice from housing offices are already being encouraged to give up their secure tenancies and move to the private rented sector. Obviously this is impossible for most, either due to the upheaval it will cause them and their families (e.g. being forced to move out of school catchment areas) but also because most people don’t have a month’s deposit plus a month’s rent in advance, plus removal costs. So the majority will be stuck, desperately trying somehow to find the extra money. Some families don’t even realise they are “under-occupying”. Those with children between one and ten years old find the children only count as half, and so will still be penalised if they don’t have a child over ten occupying a room. Most tenants around here literally won't have a spare penny and there is nowhere for that money to come from. So they are going to have to make that difficult decision to move or get into debt. -- However, she adds... -- in areas like this moving isn't really an option because there just aren't enough smaller places to move into. We estimate 44% of our tenants in this area are under-occupying with nowhere smaller to move to. … On top of that we have high unemployment and low wages so it doesn't add up. Despite all the guff we get about living in a democratic society the Bedroom tax is a clear example of what that means in today’s crisis-ridden democracy. The assumption that the state is responsible for providing a minimum level of welfare for the most vulnerable people in society — which all the capitalist parties once shared — has been eroding for decades. Universal welfare has proved to be a temporary sop to the working class, limited to those long gone post-war years of plenty. As the economic crisis has deepened, as unemployment and underemployment have grown, so has the viciousness of the attacks on those who find themselves at the bottom of the heap. To be poor is to be blamed for the ills capitalist society itself has created. Increasingly the propaganda is as simplistic as it is nasty; the ‘skivers’ versus the ‘strivers’, the undeserving poor versus the deserving rich, with the poorest caricatured as feckless, criminal, lazy scroungers whilst tax dodging millionaires are lauded as ‘wealth creators’. It would be funny if the results weren’t so tragic. At the heart of this latest attack on tenants is the decades-long attack on wages, which has meant that 60% of people who get benefits are actually in work. In the pre-crash years the state was willing to subsidise businesses who wanted to pay a minimum wage (or less, if they could get away with it). Like a modern-day Speenhamland system ‘tax payers’ were subsiding low wages in order to keep tin-pot businesses from folding. The reduction in wages and hours (with the introduction of more ‘flexible’ working patterns) meant the state had to intervene via working tax credit to keep the whole system in operation. But now that wage rates and living standards are being driven down anyway as a result of the growing pool of unemployed, there is no need — from the point of view of those whose job it is to defend British capitalism — to keep on supplementing low pay households. Under the banner of the need to balance the budget and pay off its debts, all factions of the British state agree that the right to a civilised standard of life is a thing of the past. The Bank of England has conjured trillions of pounds out of the air to prop up the banks and the financial system but the poorest are being made to pay through their teeth. The Universal Credit, due in April this year, is being sold as a way to simplify the benefits system. In reality of course it is a way of penalising the poorest paid. The ‘conditionality’ requirements will give the state powers to force the low-waged and part-time workers who currently depend on Working-Tax Credit to take second or third jobs (within a catchment area of 90 minutes). If they refuse they could lose benefits. According to the Department of Work and Pensions itself, 1.8 million main earners in a family will be worse off if they take on extra hours under the reforms. A further 300,000 secondary earners will also be penalised for taking on extra work under the scheme. The DWP concluded that couples with children are more likely to be worse off taking extra work (3). All of these changes are designed to make the working class pay for the crisis and are forcing down wages so the UK plc can be a low-wage economy, no matter the human cost in terms of the misery it will bring to millions. 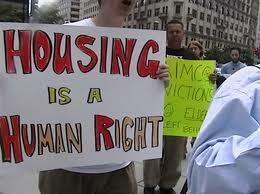 The bedroom tax is also a knee jerk reaction to the growing housing crisis. Not the problem of stagnant or declining house prices so beloved of those who want another housing boom to ‘fuel’ the economy. The real problem is homelessness. In England this has risen 25% over the past three years while government spending to tackle the problem has fallen from £213.7m to £199.8m over the same period (4). It is harder to estimate the numbers of hidden homeless, but most housing charities agree their numbers are rising. A survey by Crisis found that 62% of 437 single homeless people surveyed were ‘hidden homeless’ on the day of interview (5) and 92% had experienced hidden homelessness (6). This figure of course does not include the illegal immigrants who live in some of the most squalid conditions imaginable, often being charged extortionate rents to live amongst rubbish and rats in makeshift garden sheds, caravans and garages. According to the BBC, local councils estimate there are 10,000 sheds concealed from view across London and the Home Counties, lining networks of alleyways. Some councils are resorting to satellite imagery to calculate exactly how many such structures they have and are calling on the government for greater powers to inspect these buildings! (7) These are landlords to put Rachman to shame. In many cases extremely high rents are being charged so that house owners can pay off their own mortgage. In capitalist terms this has a certain enterprising logic to it, and if as many people as possible are crammed in to share the cost this is not really the responsibility of the shed owner. Low interest rates are undoubtedly staving off a much bigger crisis in the owner occupied sector, but for those not lucky enough to have got on the housing ladder at the right time, housing is a massive and growing expense. Rents are currently rising at a rate of 2.9% a year and the average monthly rent in the UK is now £725. In London rents climbed by 4.8% to reach a new high of £1.057 (8). According to a survey by the Halifax published in January 2011, house prices rose by 91% from 2000, but the average salary increased only by 40%. Many of the current problems can be traced back to the early 80’s and Thatcher’s push to sell off council housing and make us a nation of home-owners. The policy was a huge success and led to a massive decline in the council sector as most of the best stock was snapped up. In 1977 30% of the UK population lived in council housing. As of the last census it is 14% and dwindling. Although the right to buy brought in millions of pounds to state coffers, councils weren’t allowed to use this money to replenish their stock, and so the sector was reduced over the years to the least popular and most troubled estates, many of which became breeding grounds for crime, violence and anti-social behaviour. Those left out of the new ‘property owning democracy’ also found they were increasingly ineligible for council housing, as it was being rationed due to its scarcity. Only the most vulnerable were being picked up: those deemed to be in priority need, usually homeless people. As a result the private rented sector boomed, helped along by a ready supply of cheap buy-to-let mortgages. Anyone and everyone was encouraged to become a private landlord; it was an easy way to make money (if you could afford to buy a spare home or two). And for those who could it was bonanza time, a licence to charge whatever they could get away with. If your tenants were on housing benefit, all the better. Rents soared through the roof, but rather than the government stepping in and capping rents, the market was given free reign. Eventually the bill for housing benefit reached crisis point and the government brought in a rule that capped the amount of benefit claimants were entitled to (in many cases tenants now have to find typically between £1,000 to £2,000 per annum to make up the shortfall). But rather than the housing benefit bill reducing, it has risen 37% in the past five years (9) and currently stands at £22.4 billion a year (and rising). And because rents are so high and wages are so low, the number of working people claiming it has risen by 417,830 since 2009, an increase of 86% (10). the number of council sales…dramatically increased and the building of social housing halted. The UK’s population grew 4.41 million under Labour but the number of social homes continued to fall. A socialist (sic) PM did not see fit to invest in social housing (12). By the time Labour handed over to the Coalition in 2010, it had left just under one million children trapped in overcrowded housing with one in seven children growing up homeless or badly housed, while the number of people living in temporary accommodation in England had doubled to 90,000. Meanwhile there are 920,000 empty homes across the UK. 330,000 of these are long term empty (13). It should be noted this figure doesn’t include uninhabitable homes, homes due for demolition or flats above shops (of which there were estimated to be 300,000 in 2004). In all there is probably in excess of one and a quarter million empty homes currently in the UK, not including the hundreds of thousands of second homes, and not to mention the number of empty retail premises and vacant office space. Meanwhile the house building industry is sitting on a land bank of 400,000 potential homes nation-wide because ‘the market’ suggests that land assets are a safer haven for capital than building and selling homes. The government know they have a monumental housing crisis on their hands. Their response has been to push the building of new affordable homes, which has meant subsiding builders of course. The scheme has been promoted as ‘unashamedly ambitious’ by the Coalition, but so far has failed to deliver, mostly for the reasons above. Although ‘hundreds of thousands’ of affordable homes were promised, new housing starts in 2011-12 were just 15,698, a 68% fall on the previous year. The six months to March 2012 was worse, with a mere 429 new homes being started. The Coalition, and the class it represents, have no solution to either the housing problem or the economic crisis. As things get worse the attacks on workers (both practical and ideological) will get worse. The housing crisis is a permanent crisis for capitalism, and the way the government is handling it is directly forcing millions into ever greater misery, poverty and uncertainty. The dream of a property owning democracy has turned into the nightmare of high and increasingly unaffordable rents. This latest turn of the screw from a government of millionaires is particularly vicious. The past three decades have shown clearly that housing under capitalism is not a basic human right at all but something to make a quick buck from. Capitalism won’t solve the housing problem either now or in the long term. It cannot provide adequate shelter for all. So long as this crisis continues millions of hard working people will continue to be driven into greater poverty. Merely getting rid of the Coalition isn’t enough. (There have been enough Labour governments in recent years to dispel any illusions that Labour represents anything other than the interests of capitalism.) The real challenge is to get rid of the capitalist class all these parliamentary parties represent, and with it their system of profit making which feeds off the misery and impoverishment of wider and wider sections of the population. Only the working class, united beyond the divisions fostered by government policies and media propaganda, has the potential to achieve this. It may seem a long way off but that potential is increasing as the welfare state is pared to the bones and the working class is left to fend for itself. (1) National Housing Federation website. (3) Quoted in the Telegraph 13 December 2012. (4) Figures from SSentif quoted on BBC news website 31st July 2012. (5) Shelter, quoted in BBC news magazine 28 May 2012. (7) Article by Chris Rogers BBC website 28 February 2012. (8) Telegraph 17 August 2012. (10) Figures from the National Housing Federation. (11) Between 1979 and 1996 an average of 50,761 new homes in the social housing sector were built. Under Labour, between 1997-2008 only 24,299 were built. (13) ‘Homes from Empty Homes’ site. For the past couple of weeks there have been a range of protests across Britain protesting against this nasty vile piece of legislation. What all the protests have in common is an appeal to the government to scrap the tax which is highly unlikely as the bedroom tax should be seen as part of the ongoing attempt to dismantle the however inadequate so called welfare state. Alongside the call for the scrapping is the hope that the Labour Party and Labour councillors will not implement the tax or will not carry out evictions. Again highly unlikely as the Labour Party has historically been with the unions the first line of defence in the capitalist system but also the recent reports that Birmingham City council has with ASDA come to an agreement that in future any future social fund payments would be in food vouchers which can only be spent at ASDA. If both approaches are a waste of time does it mean that protests is a waste of time? I don't think so as long as we look for independent initiatives within the present campaigns. For instance a couple of weeks ago in Durham there was a protest organised by the trades council. What was good about the protest was that there was space for people to voice their objections and feelings regarding the bedroom tax. I think that this was welcome as it gives an opportunity for voices to be heard and chances for an alternative strategy to develop that puts at the centre the idea that we should not be seen as the victims of poverty but collectively as those who will abolish not only poverty but this decaying capitalist system which gives poverty the political space to grow within. Agreed Dave. Our recent experience in the protests is that people are more than ever ready to listent o an anti-capitalist message. The problem is that years of retreat have taken their toll and there is littel confidence about how to fight back. Added to that the campaigns are still dominated by the dreary "get the Tories out" cries of the traditional left which is the opposite of an anti-capitalist message. Today a whole swathe of cuts come into force and we need to fight them as well as pointing to the fact that the only figth we can really win is as you say the fight to get rid of the system that has brought us so much misery. The problem as far as I can see is that the working class does not see any alternative to capitalism which means that the struggles against the bedroom tax and even the wider struggles against austerity are contained within the parameters of an anti tory strategy. While these struggles should be supported the problem arises of how do Marxists intervene effectively. Do we also call for the removal of the tories while knowing full well that Labour would implement the same if not similiar policies. Or do we simply call for the removal of capitalism and the intoduction of communism? For me I think that we need to be involved in helping to build the protests ie leafletting, getting people to sign petitions, calling meetings while putting forth the clear reasons why these policies are being implemented and that is that capitalism does not work and that every demand we make will be ignored until the working class can mobilise as a class free from the misleadership of either the Labour Party or the Unions. For those who see the need for a communist alternative then we need to engage with these people on a theoretical level as well as a practical level so that they can in their work place their community help to organise an anti capitalist struggle. The difficulty as always is getting the balance right being involved in what at the begining are reformist demands ie scrapping the bedroom tax and the end result of a conscious working class revolution against the capitalist mode of production. The process of revolution will hopefully lead to the displacement of a pro capitalist perspective within the working class and a replacement of a pro communist perspective. Whatever happens we know that there is only further suffering for millions of workers and no hope from any pro capitalist organisation.